Before you start setting your distributions it's important to plan when you want to your message to be published. The moment your message is published it will appear on your newsroom, be publicly available on the web, emailed to your newsroom followers and search engines will be notified of the new content. Publish your message and send optional distributions right after you confirm your campaign in the Confirm step. This means you will have to manually choose the right time set make all these things happen. 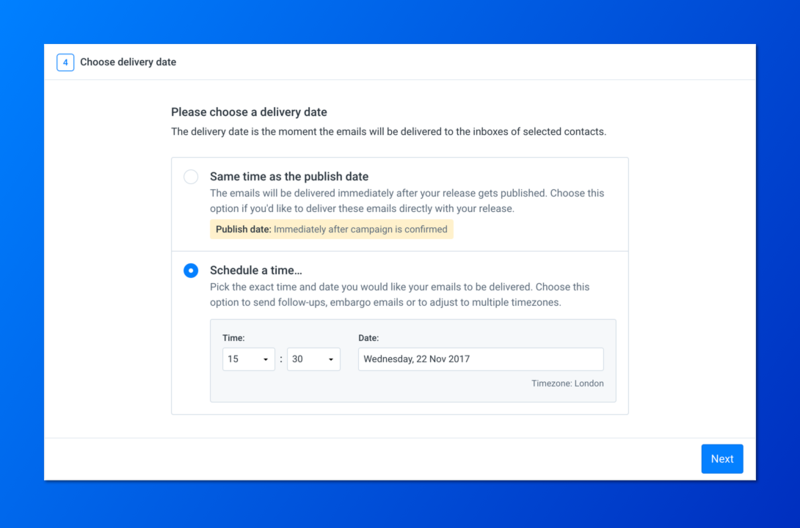 Choose this option if you want your message to be published and distributed on a short notice, for example when you don't have time to carefully plan and just want to launch your campaign. Another use case would be when the best time to confirm is still uncertain, for example right after something else has been announced or happened. When you've chosen When I confirm my campaign as your publish date you'll be able to select one of two points to send out your distribution. The first is when the campaign is confirmed. The second is a specific time that you select. Once the campaign has been confirmed the emails will be sent out according to when you've set them. Schedule your release to be automatically published on a chosen date and time. 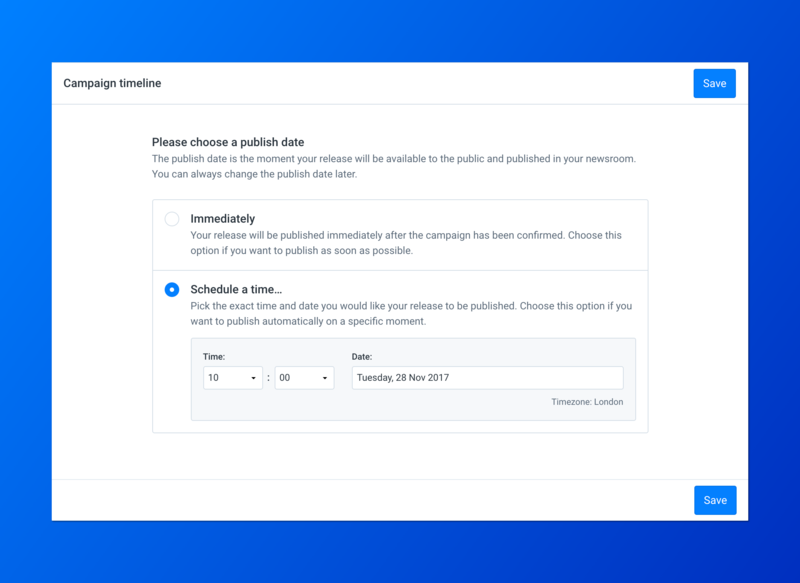 In the period between the moment you confirm your campaign and the moment it automatically gets published, your release will be available under embargo. When your release is available under embargo it means that it is only available through a secret link. When you visit your release through this link there is a clear banner explaining your release is under embargo and that it will be published on the date you've chosen. This comes in handy if you'd like to give journalists time to work on their story or when you want to give certain contacts early access. Once your release gets published the secret link will simply redirect to the public link. When you have chosen On a specific date as the publish date, you'll notice there will be two options on when to send your emails: When my release gets published and Schedule a Time. Choosing the first option will send the emails as soon as the campaign has been published. Choosing the latter option will automatically send the emails at the time selected. If the emails are sent at a time before the release has been published then the recipient will be warned that they are viewing an embargoed release. If the emails are sent out after the campaign is published then the recipients will see the release as usual. After your message gets published it is still possible to send out distributions. Here you have the option to either pick a send time for the distribution at any point in the future, or send them out as soon as the distribution is added to the timeline. This comes in handy if you'd like to send a follow-up to contacts that opened your email with further information. That's all for now, we'll update this article as Publish date evolves. Make sure to let us know if you run into any issues or if you think something is unclear: hello@pr.co!